WICKER PARK — The neighborhood's first self-serve beer bar and deli (complete with a set of adult-sized swings) hopes to open soon. That's according to Tapster's owners Roman Maliszewski and Sean Slevin, who gave DNAinfo a tour of their new Wicker Park hangout. "We have a final [city] inspection this week and hope to open after that," Maliszewski said. Just west of the Milwaukee, Damen and North avenue intersection, the 70-seat Tapster at 2027 W. North Ave. replaced Interior Define, a furniture shop that moved to Lincoln Park. Tapster is an Old English name for a bartender. "People love the idea of being able to try a bunch of different beers, but at most bars you can try maybe one or two," Maliszewski said. 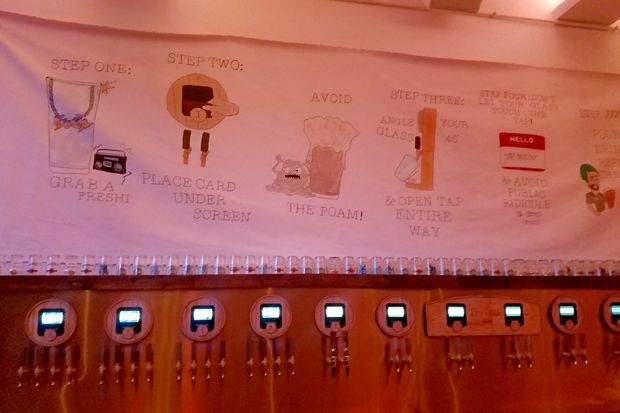 At Tapster, patrons will be able to pour themselves up to 2 pints, or 32 ounces of beer, wine and kombucha using an electronic "tapcard" that will dispense drinks by the ounce and charge by the ounce. Tapcards will be given out at a check-in counter and concierge. Customers can either start a tab or pay cash and get a specific amount of money added to the tapcard, which deducts as the beer is poured. There is a slot on the screen above the taps where drinkers place their tapcard as they are pouring. Maliszewski said Tapster will offer 62 taps along a "tapwall," serving mostly local and craft beers. Eight of the 62 taps will dispense wine, sparking wine and rose. Four of the taps will stock kombucha. Another 12 taps will be for kegged cocktails, divided into eight standards, like gin and tonic, whiskey and Coke, and four seasonal cocktails. After 32 ounces, the tapcard no longer works. A message tells cardholders: "You have reached your responsibility limit!" Patrons will then need to see a staff member or "card dealer," who will make sure they are not overserved. Watch a demonstration of how the taps work here. The 3,000-square-foot Tapster storefront is divided into three areas: a self-serve tap bar facing the overhead "L" tracks and North Avenue; a lounge in the middle with comfy chairs, reclaimed wood tables by Salvaged Wood Goods and a bar where a bartender will offer "neat" 1- or 2-ounce pours of Scotch, bourbon and the like; and in the back a bright, sunny deli with a community table and two adult swings. The leather swings, made by Detroit-based WHEEgoods, hang in a small alcove. "What else could we have put there?" said Maliszewski, referring to the small area that allows more for gently swaying than actual swinging (unless Tapster patrons want to crash into a wall). Maliszewski said he met the baby swing-makers behind WHEEgoods at Renegade Craft Fair and commissioned the larger adult-sized swings. In addition to drinks, there will be fondue, craft popcorn and a deli area offering a small selection of meats and cheeses, perhaps an essential component because Tapster has an incidental liquor license typically reserved for restaurants and not taverns. "The whole concept is a tasting bar, and we want the menu to complement that," Maliszewski said. No bottles or cans will be sold, in keeping with Tapster's commitment to the environment, Maliszewski said. The hours are still being worked out, but Tapster hopes to be open from 4 p.m. to midnight weekdays and possibly later on weekends. There will be free Wi-Fi too. Tapster will use the same Pour My Beer technology that local spots like Hopsmith and FatPour offer, though the North Avenue bar will be solely dedicated to the self-pour concept. And for those concerned about a lack of interaction or customer service, rest assured plenty of humans will be on-site, too. Maliszewski and Slevin said they will be working on-site and other Tapster employees will circulate among the wall of self-serve taps, similar to the customer experience at Apple stores. If everything goes as planned, Tapster could open by this weekend. To stay updated, "like" Tapster on Facebook or follow the bar on Twitter at @TapsterChicago.